Does your dog get excited when the doorbell rings and guests arrive at your home? Does he welcome the visitors by barking and jumping on them? This is a natural way for dogs to say ” Hi, I am Glad and Excited to See you”. But not everyone likes that kind of behavior especially if the guests you are expecting don’t like dogs or feels uneasy to have something jumping on them. 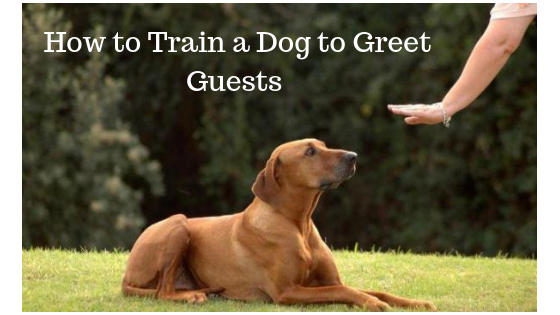 A Dog owner can change this natural tendency for dogs to jump and greet guests if they read and follow the tips in this post How to Train your Dog to Greet Guests. Teaching your dog how to greet someone coming to your house will teach dogs how you want them to behave when someone rings the doorbell and comes inside from the front door. After Researching for a lot of ways and steps to teaching a dog to greet visitors, here are some of them which have worked for dog owners successfully. A comfortable bed or mat for your dog to lie. Treats to reward the desired behavior. Friends to Ring the Doorbell again and again. There are 2 methods that I thought of which can prove useful and have been working well for dog owners. Let’s talk about them. Tie your dog on the leash and tell your friend to ring the doorbell. When your dog starts barking, tell him to stop it by giving command “Stop Bark” and when you repeat this number of times, he will stop barking. Reward his behavior with a treat. Repeat this until he doesn’t bark even if he is off the leash. He will learn to calm himself. Place the dog bed or mat at a visible place near the front door from where your dog can watch the door and listen to the doorbell. As you have taught your dog to stop going to the door and bark every time he listens to it, it is time that we make him learn where he should go when he listens to the doorbell. 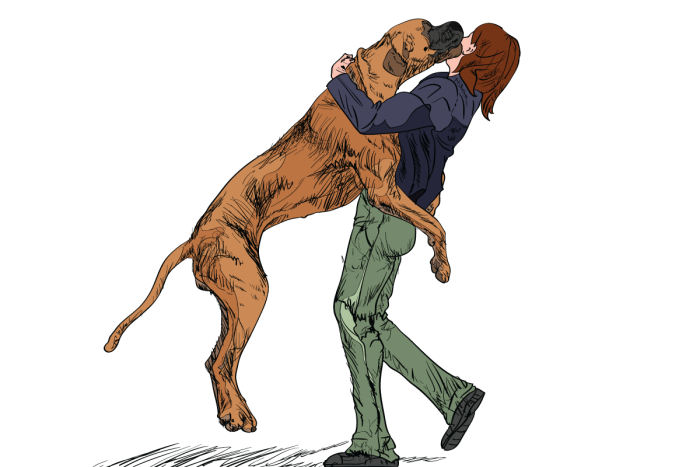 Whenever you enter the house and your dog starts jumping on you, ignore his behavior instead of showering him with love. Then take him to his bed and give him a treat. Keep trying and repeating this till he keeps sitting at the place when someone rings the doorbell. A lot of praises and treats will make this part easier. Request a friend of yours who likes dog as much as you do to come over to your place and help you in this training. He will ring the doorbell and he will also ignore the jumping and barking behavior of your dog. Eventually, when your dog will calm down, your friend has to offer him a treat and command him to go sit at his place, that is his bed. As soon as the guests arrive or the doorbell rings, ask your dog to go to the bed or mat and reward him when he obeys this command. Hold a treat to attract your dog towards your hand and then signal him to go to his bed pointing towards the bed with fingers and then offer him treat only after he sits on his mat. Repeat and Practice these steps regularly.Hold the treat in your hand and give him the command to ‘wait’. Do not give him the treat if he does not stay still. Try this with another Treat. Gradually increase the time that he waits for you to give him the treat. Be Patient. Your Dog is Learning something new. Also, you are not a Professional dog trainer that you would get instant results and you should also not expect that as well. Don’t make your dog feel that you are not happy when he doesn’t do something that you wish him to do. 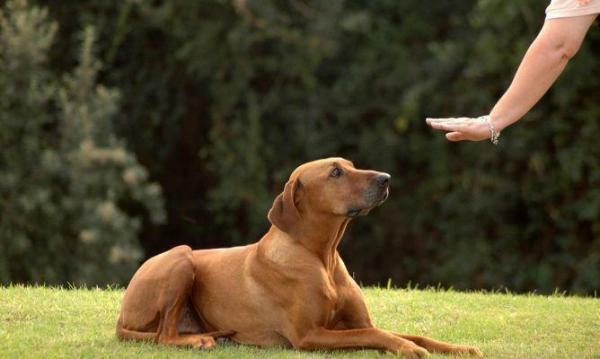 Make sure your dog has already learnt the basic training commands and if he has not yet learned, you can learn how you can teach him basic commands from Doggy Dan in just 1$.